Vegetarians don’t have hot dogs to turn to when they crave fast food. We have falafel in bread. Deep fried chickpea balls served with vegetables, tomato salsa, hummus and a yogurt sauce. During my years as a vegetarian I have probably tried every single falafel restaurant in Stockholm, many in other parts of Sweden, and a few on other places around the world. But strangely enough I have only made them myself a handful of times. So we thought it was about time that we made our own version of falafel in bread. 1. To skip the bread and wrap them in big green leaves instead. We learned to do this on our trip in Vietnam. Cabbage leaves are perfect in size and have a great crisp taste. You could also try big lettuce leaves. 2. To bake them instead of frying them. The whole deep frying thing doesn’t rhyme well with us. Also, it is not necessary at all. As long as you bake them on a high temperature they will be crunchy on the outside and soft on the inside. 3. To make them green. We once tried these really nice tasting falafels that were completely green on the inside. We can’t remember what they were made on, but in our version we used pistachio, parsley and mint to achieve the green look. Apart from looking nice, these ingredients also makes them taste divine and oh so flavorful. 4. To make them vegan. Even though we eat egg and some dairy products, we try to keep some of our recipes vegan. 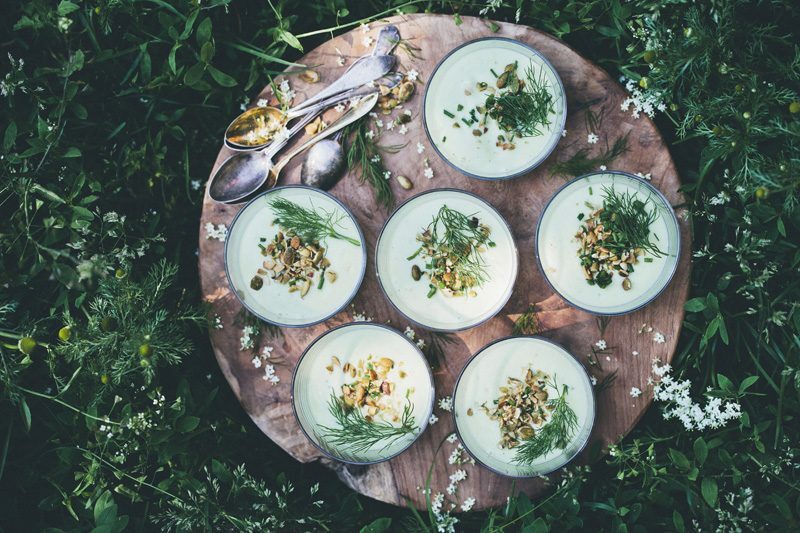 This time we made the yogurt dressing on soy-yogurt (look for it in health stores). Since we used buckwheat flour we also managed to keep them gluten free. 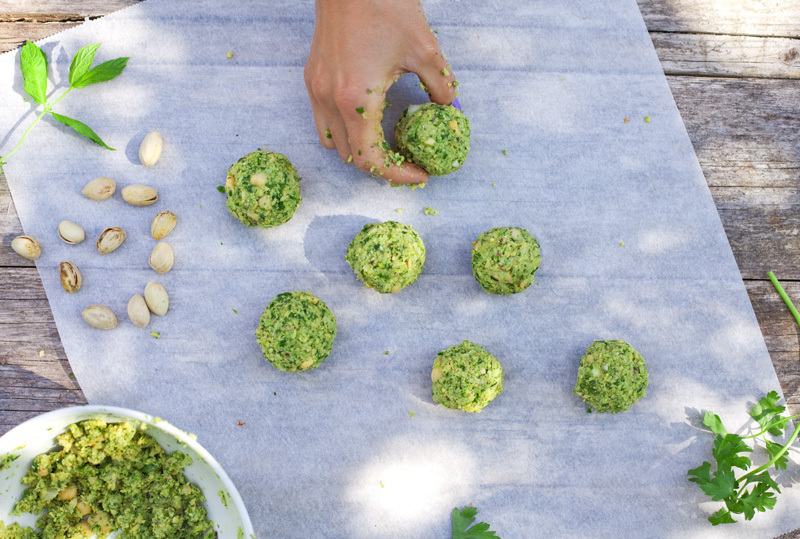 We used mint and parsley to flavor and color the falafels, but feel free to try it with whatever fresh herbs you have growing in your garden at the moment. Start by blending the herbs in a mixer for about 30 seconds. Add pistachio nuts and pulse until well combined. Rinse the garbanzo beans. Add them and the rest of the ingredients into the mixer and blend for about a minute. Youmight have to stir around with a spoon occasionally. 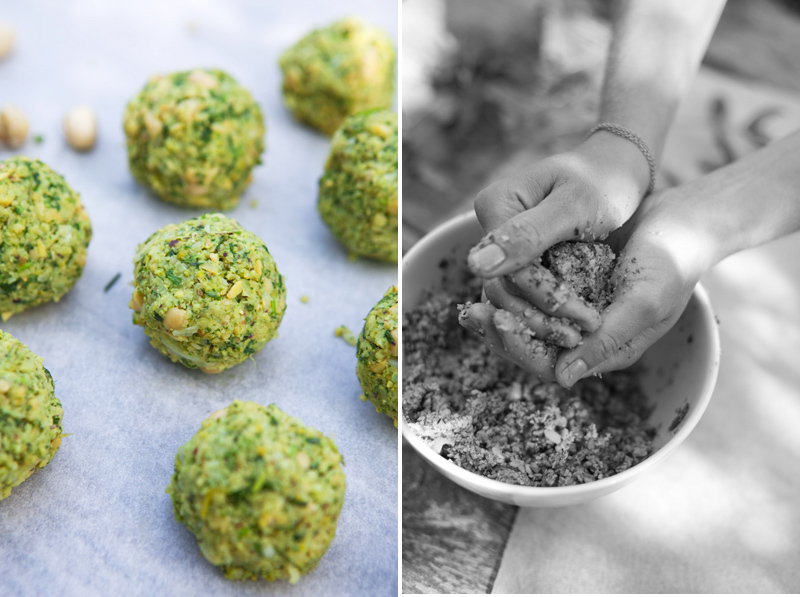 Try to keep the texture of the falafel dough a little rough. Make 24 small round falafels, place on a baking sheet covered with parchment paper and bake for about 15 minutes on 375°F/200°C, turn every 5 minutes to get an even brown color. Whisk all the ingredients in a small bowl until they are combined. Add yoghurt, mint and lime in a bowl and stir around until combined. Place in the fridge for 30 minutes to get an intense mint flavor. Chop the ingredients and add everything to a serving bowl. Stir around. Add salt and pepper according to taste. Serve immediately or put in the fridge for 30 minutes to get more intense flavors. Separate the leaves by turning the lettuce and cabbage upside down and removing the stem or cone with a knife. Put it under running water and gently separate the leaves one by one. Pat dry. 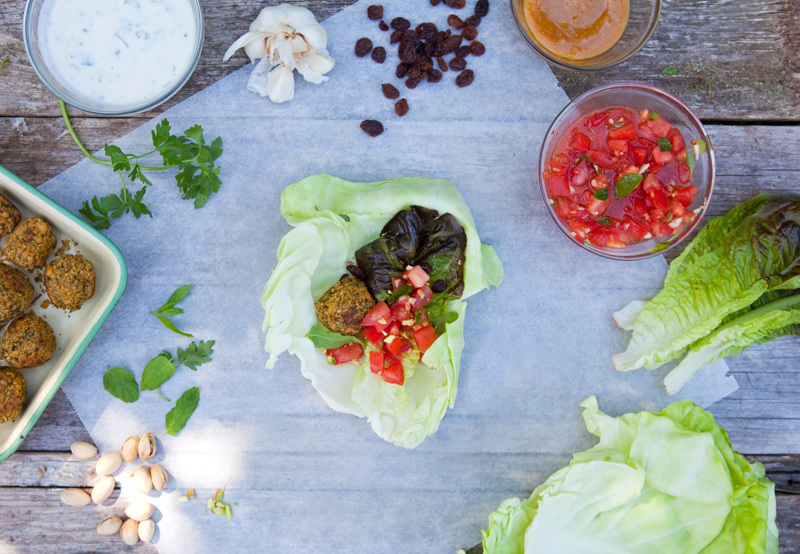 Hold one cabbage leaf in your hand, place a lettuce leaf inside of it, add 2 or 3 falafels, a spoonful of cashew nut dressing, mint yoghurt, tomato salsa and top with some fresh herbs, chopped pistachio and a couple of raisins. Fold it gently. Enjoy! Beautiful! I love the color of those falafels! I love falafel! I used to make them at home with a mix of the brand fez (they're also bright green on the inside!) but now I'm going to try and make these instead! Any idea what could be done to replace the wheat? My partner is celiac so can't have it, or many related things, but other than that this looks particularly yummy for our limited diet. We're not vegan/vegetarian (Sorry, I'm actually a carnivore...) but there are so many things that make her sick that a yummy recipe like this is a huge coup! Delicious! These look like the perfect lunch or dinner for us. My kids would miss the pita but I think I could win the lettuce wrap at the present since we are trying to slim back after vacation week. The photos are just wonderful. Ohhh my, pistachio! What a fantastic idea...and I thought falafel couldn't get much healthier anyway. Like the cabbage idea as well, bread with vege patties is often too dry but using the patties as the bread means greasy hands. The photos are stunning and the ingredient list makes this recipe incredibly enticing. I have big plans for these falafel. They look good enough to plan a party around. I came across Your blog recently and i can´t get enough! 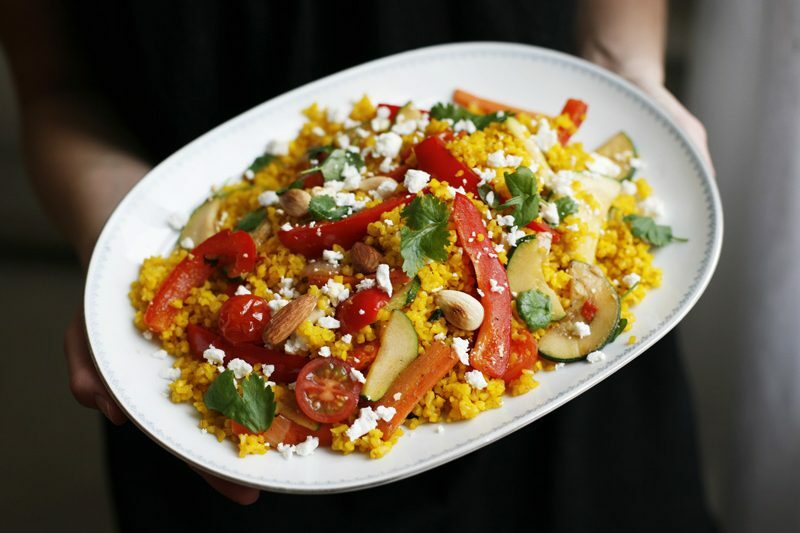 I love vegetarian food and i´m in love with your recipes. 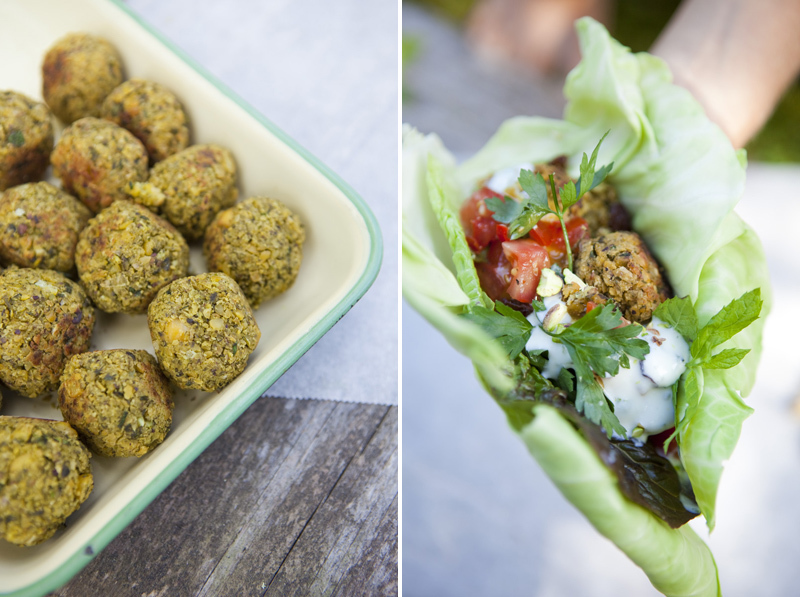 This falafel looks absolutly delicious and the photos are exquisite! Just love it! These look so good, and I am definitely on board with your ground rules. It always annoys me when falafel gets ruined by greasy deep frying and ends up tasting more like toast than anything else. This has sparked off so many ideas in my head...bright purple falafel...? This is awesome! So beautiful your photos and it seams to me a very helthy vegetarian meal! Congratulations! 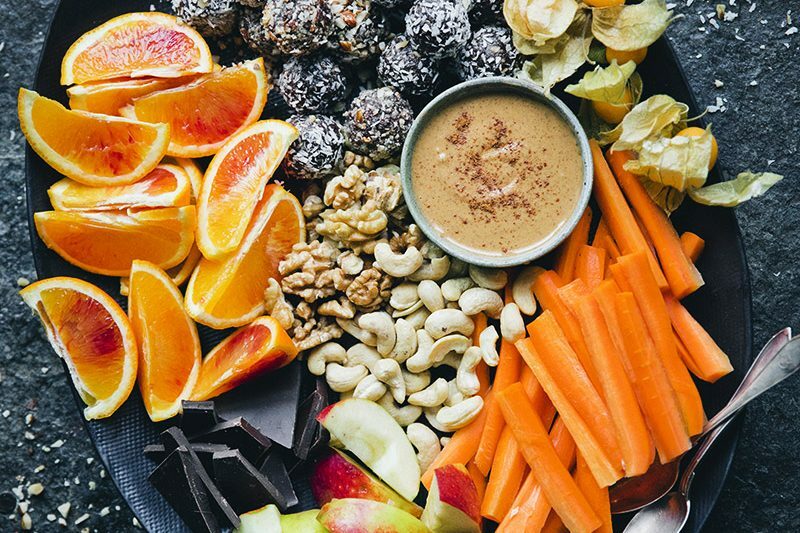 Oh my goodness... this looks delicious from start to finish. 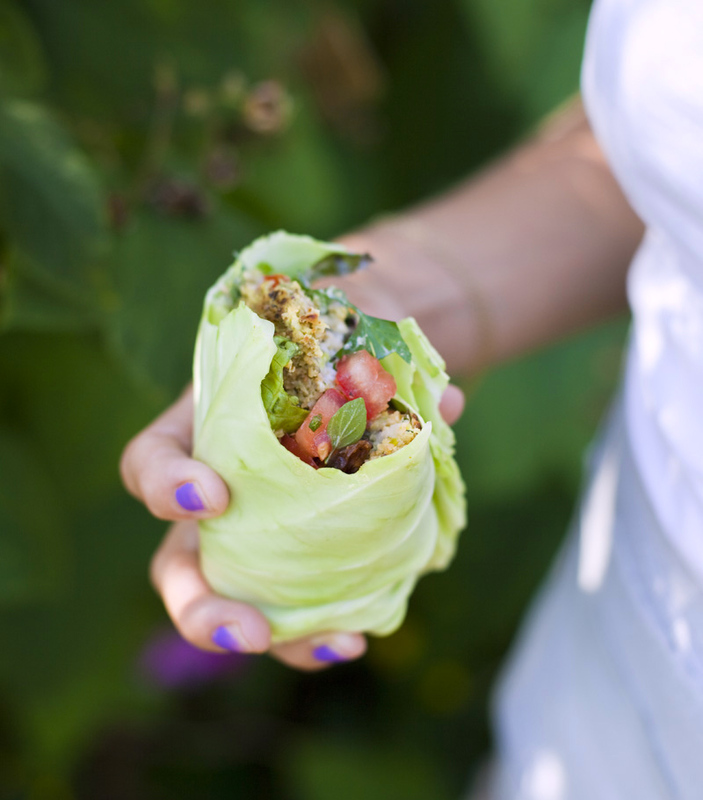 I need to make some felafel & soon.. will have to try this pistachio recipe (and very cool use of the cabbage as a wrap) sometime soon! I love this. I love that they're baked rather than fried, wrapped in lettuce instead of bread, and so vibrantly, vividly green. Gorgeous photos, as always. This is fantastic! I convinced my family to let me make them eat vegan/whole foods/plant-based for a week, and this is on my list now! These look fabulous, and I love the leaves instead of bread -- I used to do that back in my "low-carb" days ;) I also love that you include vegan recipes. This might be the prettiest falafel I've ever seen! I love the bright green color. The cashew dressing sounds amazing too. I will definitely be making this soon! Thank you for sharing! The only time I have ever made falafel they turned out green because I used so many herbs. These look amazing, and I love the lettuce wraps. Will definitely share this recipe, thanks! These sound so delicious. 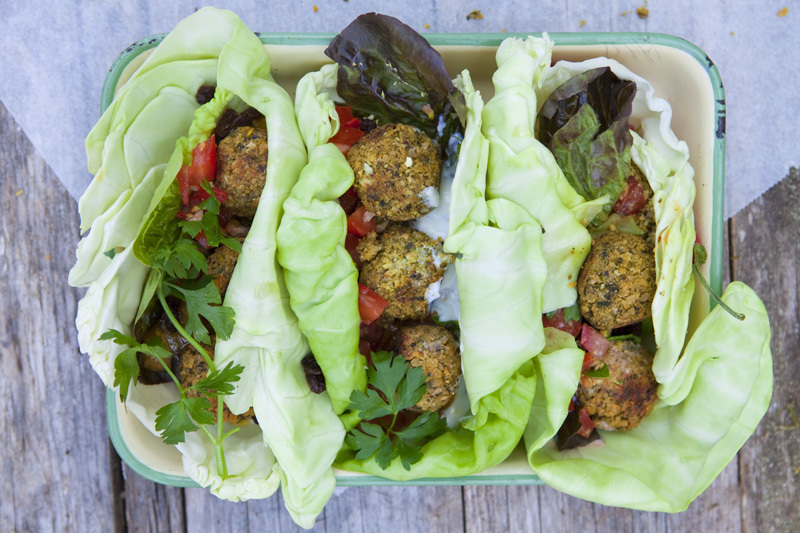 Love anything packed with fresh herbs but using pistachios in the falafel and then those fabulous sauces...wow. Beautiful pictures too. 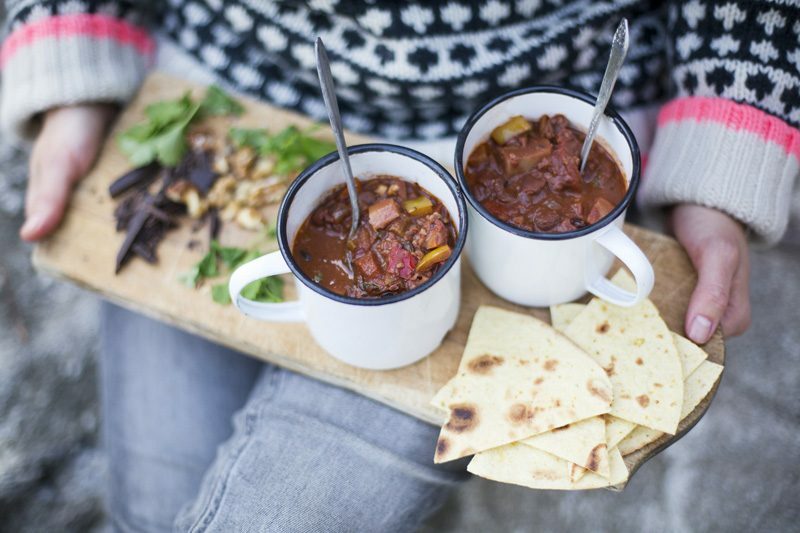 Thank you for including vegan recipes on the blog, definitely appreciate it! I waited (very impatiently) all day for this post!!! And, my friends, you did not disappoint! This is my kind of dish... and I can't wait until the day I can actual sit down to make this.